LOWELL — So you want to order food — but your restaurant of choice doesn’t have its own delivery service, and you might not be able to get there. What do you do? Instead of settling for the same old pizza, new services like Dashed, just launched in Lowell last week, are making delivery from your favorite restaurants a reality. “We’re providing delivery for restaurants that normally don’t have delivery, and we’re doing it in 40 minutes or less from the time a customer places an order,” said Dashed Founder and CEO Phil Dumontet. A Boston resident, Dumontet has temporarily relocated to Lowell to oversee the launch and cultivate the approximately 30 restaurants and growing that use the service. That list currently includes restaurants in Lowell, Chelmsford and Dracut — all in about 7-mile to 8-mile radius from Lowell, he said. Among current partners are Blue Taleh, 1981Ramen, Olympia Restaurant, Brew’d Awakening, Nobo Restaurant and Lo Kai. Dumontet said about another dozen will be added in the first two weeks. A New Jersey native, Dumontet, 29, created Dashed in 2009 around the time he graduated from Boston College. He partnered with his brother, Christian, who developed Foodler, an online food-ordering app, in 2004. An impatient college student, Dumontet said he’d tried various delivery services that took far too long. He started making Dashed deliveries on his bike in the North End and began hiring friends as drivers when it took off. The service has since expanded to 800 restaurants in six New England cities and more than 700 team members on staff, he said. Lowell became the sixth city this month, preceded by Worcester in January. There are about 15 drivers currently dedicated to Lowell, and Dumontet aims to double that in the first month. 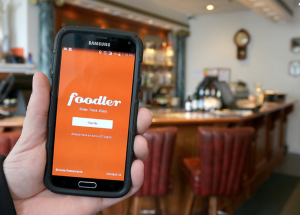 All orders are made through Foodler and are quickly transmitted and confirmed by the restaurants, Dumontet said. Dashed employs drivers much in the same way as rideshare companies Uber and Lyft — they even share some of the same drivers, he said. Because the drivers use GPS, customers can track their food in real time, Dumontet said. “You can see where your food is until it arrives at your door,” he said. Customers also receive notifications when their food is about to arrive. Dashed deliveries carry a $4.99 fee. Costa Cocalis, president of Olympia Restaurant, said he was happy to partner with Dashed when Dumontet approached him. Olympia also partners with Takeout Express, a smaller delivery service that works with a handful of restaurants in Lowell and Dracut, but it doesn’t offer online ordering. Online orders eliminate a lot of the communication errors and mix-ups that can occur with bad cellphone connections, he said. So far, Dashed has been working really well for Olympia, Cocalis said. “It’s added revenue,” he said. “Even though we’ve been here forever, there are new people coming to the city all the time that might not know about us. It could be a potential way to reach out to them. Julian Yu, dining manager at Nobo Restaurant in Chelmsford, said customers have increasingly demanded that the restaurant offer delivery for its Japanese cuisine. Partnering with Dashed and Foodler helps to satisfy that demand, he said. “We just went live this past Monday, and so far it’s pretty successful,” Yu said. He said he feels even more people will take advantage of the service as word about it gets out. To learn more about Dashed and its partner restaurants, visit dashed.com or facebook.com/DashedDelivery. Download the Foodler app through the Apple App Store for iPhones or through Google Play for Android phones and look for the Dashed icon next to restaurant names.